With many young drivers descending on Florida for spring break, it is natural for people to get nervous about more people on the road who will be texting while driving, talking on their phones and even having complete meals while behind the wheel. Indeed, most young drivers believe that texting while driving is a bad idea, and could lead to horrific accidents. 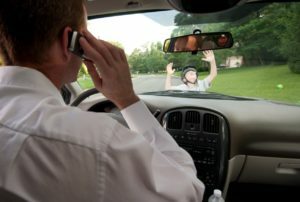 However it appears that they may not realize that distracted driving goes beyond using a cell phone. According to a study conducted by Oregon State University, more than a quarter of teens said that they sometimes change clothes while driving. Young drivers also reported putting on makeup, changing contact lenses and even doing their homework while behind the wheel. These forms of distracted driving, while seemingly limited compared to cellphone use, can still lead to accidents. And it should still be a concern given that distracted driving is the leading cause of death among young drivers. Despite these dangers, distracted driving is still an example of the failure to use reasonable care that could lead to liability in the event of an accident. Why is this? There is an expectation that all Florida drivers act as a reasonable person would while behind the wheel. This means that they will obey traffic laws, avoid aggressive driving and most notably, limit distractions while driving. If a driver fails to use reasonable care and such a failure leads to an accident, the offending driver could be held responsible for the crash, and the ensuing injuries. We hope that drivers here for spring break take these precautions.